Electronic Document Management System (EDMS) Market size was estimated at over USD 2 billion in 2016 and is predicted to grow at over 15% CAGR from 2017 to 2024. 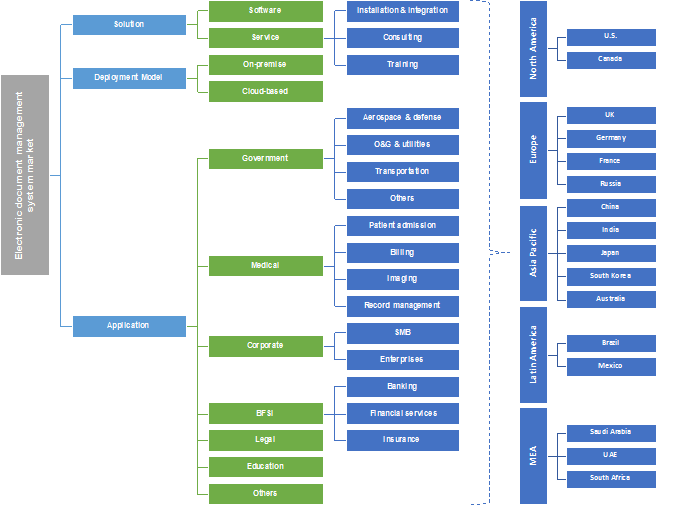 Emerging trend of software as a service (SaaS) and cloud computing, coupled with the favourable regulatory scenario is anticipated to escalate electronic document management system market growth. The growing trend of Bring Your Own Device (BYOD) and integration of document management solution with mobile devices has propelled adoption of the technology among enterprises. Government initiatives and mandates on data storage protocols are expected to offer growth opportunities for the market. A major factor propelling the industry growth can be attributed to the benefit of a paperless environment created by such solutions. The system reduces the costs and time associated with document management by providing multiple version control and federated searches. The document management software is integrated into the business process thereby allowing organizations to effectively manage their documentation needs. Industry players are focusing on innovation and technological evolution to customization and enhance their product offering. 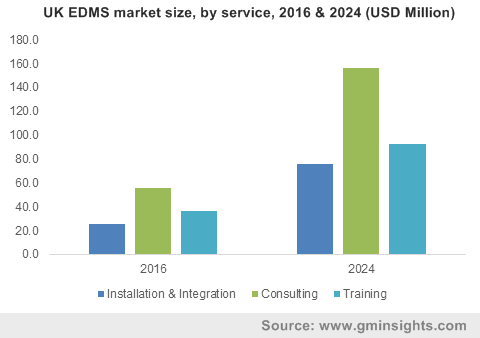 Ease of integration of the system with existing and new technology solutions is expected to drive EDMS market penetration. The need for software to incorporate services such as social integration, cloud-computing, workflow collaboration and smartphone accessibility is on the rise. However, integration issues with existing applications and data security concerns are factors restraining the market. The high costs associated with installation, training and maintenance further challenge the industry growth. The software providers offer network / server-based solutions, client’s desktop and cloud based solutions to manage their business documentation requirements. Many software developers in the electronic document management system market are now targeting the need for customized content and process management. Essential features of the software include compatibly, scalability, ease of use, communication, versioning, mobile device integration, backup, collaboration and security. The demand for document management services is anticipated to witness sharp growth in the market over the forecast period owing to the growing need for educating workers on technology usage and demand for consultation services across industries to optimize workflow. Service providers bridge the gap between software developers and end-users. On-premise electronic document management system market includes an array of desktop-licensed third-party software, that integrates with the organization’s existing IT infrastructure with dedicated on-site servers. The adoption of cloud-based EDMS is driven on storage space cost, low maintenance and hyper-collaborative tools that allow users to adapt the technology without having to alter their information architecture. In enterprise document management realm, the adoption of cloud-based systems has been comparatively slower and more cautious than standalone software. This can be attributed to the limited bandwidth of cloud computing for large organizations and high risk of data security owing to rise in cyber-crimes. However, ease of information access and storage, coupled with low subscription costs of cloud-based solutions is expected to drive growth for cloud-based solutions over the forecast period. Web-based EDMS provide a Graphical User Interface (GUI) and works through portals that are browser based. Such systems allow for scalability, ease of access and reduce costs for small or large organizations. The global demand for electronic document management system market solutions has been relatively high in the BFSI and government sector. Government application of these solutions can help eliminate need for paper based documentation and streamline workflow for efficient provision of information to citizens. Moreover, it enables governments to provide the transparency and improve efficiency at all levels of government departments. With the growing volumes of paper, the adoption for digital documents can enable staff and constituents to achieve huge cost savings. Demand for electronic document management system industry in healthcare applications is expected to witness sharp growth over the future. This is due to the growing adoption of HIM, PACS, RIS systems and EMR systems, coupled with the regulatory demand for patient data recording. Integration of EDMS with existing healthcare systems can result in enhanced clinical efficiency and improved patient care. Growth of the IT healthcare market globally, is also expected to drive demand for advanced patient monitoring systems in hospitals and clinics. North America and Europe is expected to hold a majority share in the electronic document management system market due to the adoption of such solutions in healthcare and financial industries in these regions. The U.S. market dominated the electronic document management industry in 2016 owing to the presence of technology giants and high technology penetration. Asia-Pacific region is expected to grow significantly in the coming years owing to favourable government initiatives in countries such as China, Japan and India. The demand to streamline workflow and improve efficiency has led to increase in adoption of the solution across industry verticals such as medical, government and BFSI. EDMS enable organizations to manage and control the documentation process. Moreover, it controls the creation, authentication, storage, distribution, centralization, deletion, retrieval and collaboration of the documents. Such systems help organizations to streamline their content and organize their workflow. Some vendors in electronic document management system market comprise eFileCabinet, Google, DropBox, Alfresco One, and FileCenter. Key player trends include mergers and acquisitions, new product launches and technological evolution to develop versatile document management software. Regulatory scenario and technologically advanced products are expected to drive market growth in developed and developing nations. Companies are emphasizing on product innovation and customization to suit diverse application needs and serve as key differentiators among various industries. Electronic document management system market providers offer on-premises, web-based and cloud-based document management systems for desktop, web, and mobile platforms. Provision of collaboration tools and features such as remote document access, e-mail client integrations, text editing and tracking, digital signatures and mobile and social media integration, hosted storage services serve as key enablers for technology penetration. Industry is characterized with collaborations and integration among EDMS software providers and content collaborators. For instance, eFileCabinet, Inc. announced the full integration of its software platform with Citrix ShareFile, a file sync and share system company. Various market players are focused on providing interoperable systems and ease of integration with existing document software.